We are starting a monthly wine night. Simple casual night with a theme. It will be hosted by one of our fabulous staff who will introduce each wine and look after you for the night. The kitchen will design a main meal that will match the theme. Optional dessert menu will be offered after. 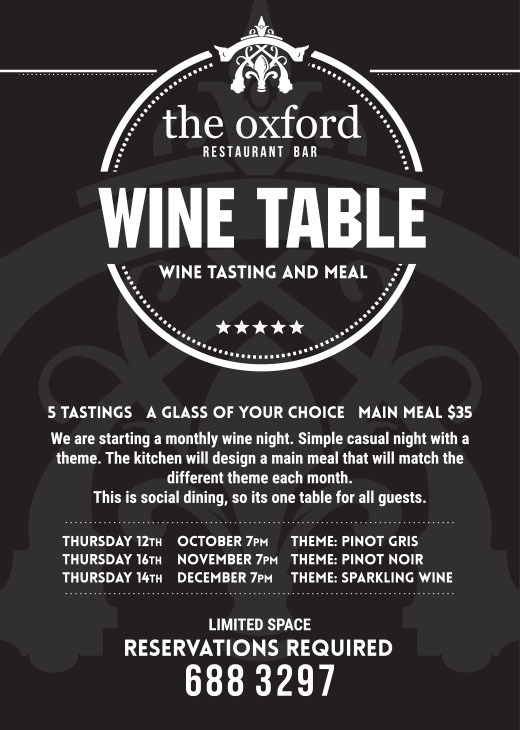 This is social dining, so its one table for all guests, giving you an opportunity to discuss the wines with your neighbour. Creative Corner Early Learning Centre are holding a fundraiser with support from the Oxford. We are turning the Oxford into a Casino for the night! 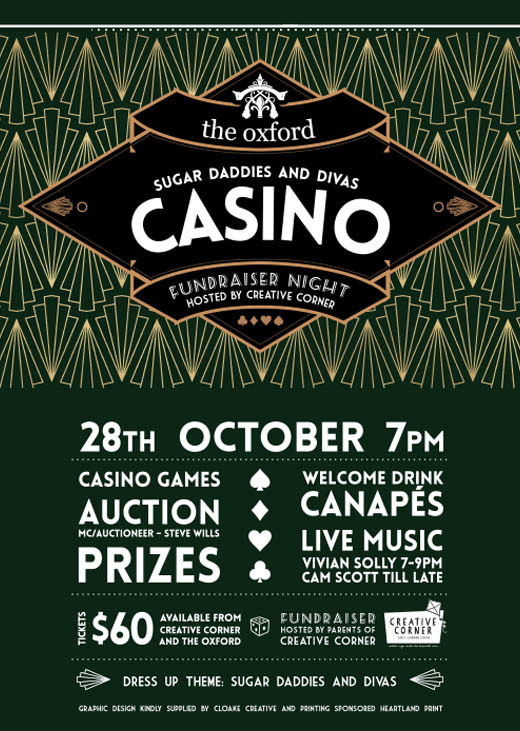 There will be casino games run by the parents including Roulette, black jack, horse races and poker. Live music - Vivian Solly will be our lounge singer and Cam Scott will be rocking it out until late. There will be canapes throughout the night and a dessert bar set up by the parents and staff of creative corner. A bit ticket auction will be held with some great prizes, including a helicopter flight for 4 with Richie McCaw!! Very limited event and already loads of interest so buy tickets at the Oxford or Creative Corner now! The Oxford are getting behind Timoru and Movember in support of their Soap Box Derby being held on George street. Competitors will be flying past the Oxford through the obstacle course to the finish line. As the road will be closed we are moving outside to have street dining - literally in the middle of the road! We will have the best advantage point to watch the race! 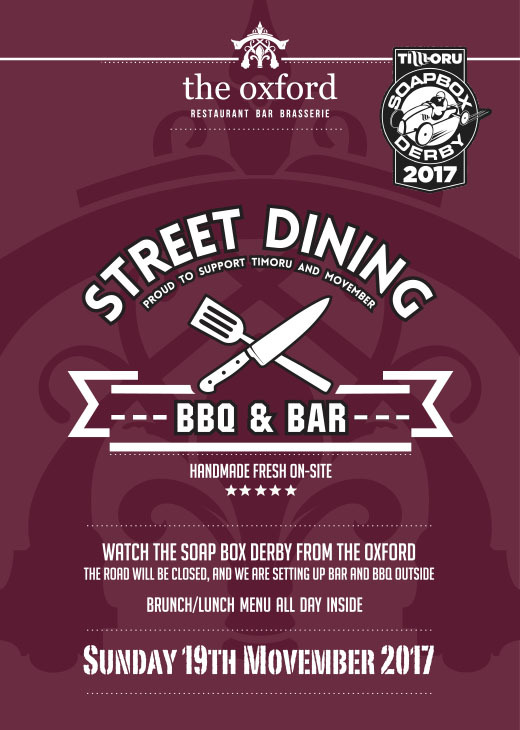 Kitchen are setting up a BBQ for some fun street food and we will have a bar set up too, as its bound to be thirsty work. So come and support Movember and the Oxfords Soap Box Derby Team – yes we are entering the race. No reservations taken for outside area, so get down early. Our full lunch brunch menu will be still offered all day inside. 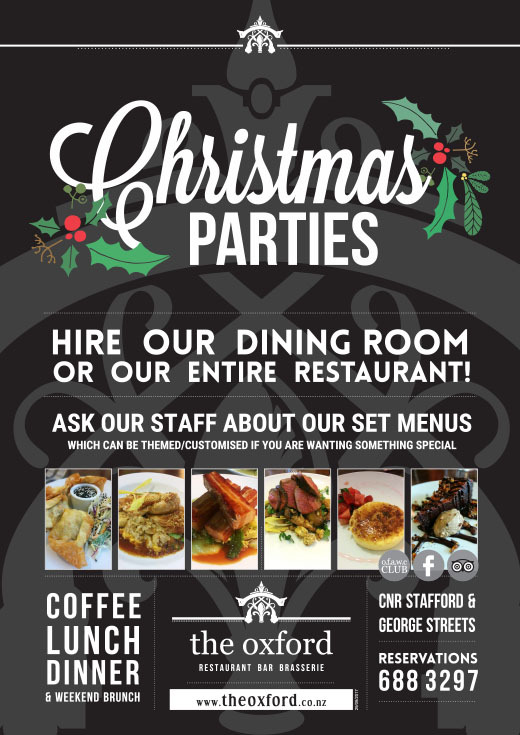 If you are wanting to come to the Oxford for your staff or family Christmas party. Don’t leave it much longer, we are filling fast. Friday/Saturday nights are almost all gone! Don’t forget we also offer a long lunch option and ask about our end of work year breakfast on Thursday 21st December. We can cater for groups of up to 36 in our dining room, up to 60 in the entire restaurant or up to 100 people for a standing function.